The heavy duty LED housing is constructed of cast aluminum. The mounting box is constructed of .063” thick sheet aluminum with a welded seam. The hinged door frame is constructed of .093” sheet aluminum. An EPDM foam and silcone rubber gasket is used for a watertight seal. Available in 5000K Cool White (+/- 150K) color temperatures propagated with LG Innotek 3030 LED’s. Minimum 80 CRI. Available with 90-300V 50/60 Hz. 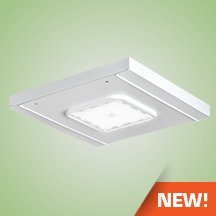 LED’s rated over 50,000 hours (TM21 Calculated L70) at 25°C ambient temperature with available 1400mA operation. Lumen Maintenance >97% at 50K hrs. 347V and 480V input options available. Standard 0-10V dimming. Driver provided with integral 4kV surge protection that meets IEEE C62.42.2-2002. 10kV Surge Suppressor standard. Built-in Active PFC Function. LED Power Supply conforms to UL1310 Class 2 and UL8750 standards and is IP67 rated for wet locations. The fixture can be easily installed by one person. It may be mounted into a 12” or 16” deck pan. Door/LED assembly utilizes quick release hinges to allow the fixture body to be mounted first using 4 Pan Truss screws. Door/LED assembly may then be attached to the body and wiring connections made. A silcone sponge gasket and clamping plate is installed from the top of the canopy to prevent water intrusion. Incoming power connections can then be made inside a wet location juntion box (provided by others).